Raunak Singh kept his promise. Within a week’s time, a brand new Mercedes C Class was added to the parade of cars in the compound of the Andheri housing society they lived in. And overnight, Raunak’s new found love for cars became the talk of the society. A few restless tongues started wagging, and conjectures were made about the possible reasons for this sudden change of Raunak’s heart. The dreaded finger of accusation was, more often than not, pointed towards Lajjo. The fact that both Lajjo and her new Mercedes were superior to the other members of their respective species in the society made matters even worse. The green goblin called jealousy has a strange way of making its way into the hearts of unsuspecting people, putting them at its mercy and making them do things they would not do otherwise. So it wasn’t surprising when Mrs. Sharma, the next door neighbor of the Singhs, came to meet Lajjo with the reference of an “awesome driver” she knew about. Mrs. Sharma’s charm worked well, as always. Lajjo convinced herself to discuss the matter with Raunak, who in turn, convinced himself that since the Sharma’s have always been good neighbors, their reference is well worth a try. And both of them convinced themselves that they need a driver as soon as possible. So why not this one? Why indeed? Perhaps, because Sajjan Singh may not turn out to be very sajjan after all. Perhaps he, in his village, got away with………… !!! But this is not the right time to talk about that. Let us not get ahead of the story. For now let’s see what Sajjan has to say for himself. “I am a pucca driver sir ji,” Sajjan Singh was convincing Raunak, standing humbly in their drawing room. “I no driving ulta putla. Promise!” He solemnised the promise by placing his hand on his head. “How much of experience do you have?” Raunak asked, still doubtful of the promise. He never liked unnecessary theatrics. Four years of driving experience wasn’t bad, thought Raunak. “Do you know how to drive a Mercedes?” Raunak asked further, the pride of a Mercedes ownership ringing loudly in his voice. The mention of “S Class” stung Raunak like a bee-sting. How dare this commonplace driver try to humiliate him! 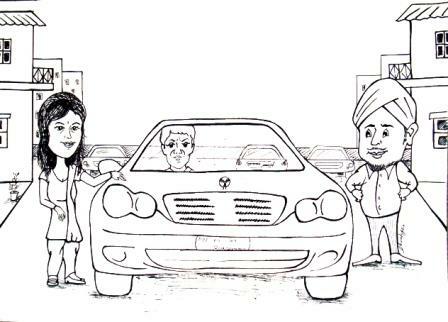 He had spent almost thirty lakhs in buying his car! Thirty lakhs! And this driver was lecturing him about class? In his sudden rage, he was almost about to abuse the driver and fire him right away. But then he looked at Lajjo’s face. And all his anger melted like an ice cream on a hot sunny day. He saw a glimpse of an approaching smile on her face. It was too precious to be spoilt because of this stupid driver. Raunak decided to give Sajjan a chance. His subconscious wasn’t satisfied yet. But he trusted the Sharmas. “You’re hired!” Came the verdict. The green goblin had done its job. The Singhs had fallen for the combined charms of the Sharmas and Sajjan. Wise people say that the driving style of a person is the surest indicator of his character and nature. Nine out of ten times, you will find a person living his life exactly the way he drives his vehicle. If Sajjan’s driving was any indicator, the future didn’t look too bright. He drove the car like a maniac speeding up and slowing down so abruptly that Raunak heart almost came to his mouth every time Sajjan put the brakes. Changing lanes, while driving at more than seventy km per hour was a child’s play for him. If that wasn’t enough, he did his best to compete with every passing car and to try to overtake it. Under the hypnotic spell of the Sharmas and Sajjan, Raunak ignored these ominous signs for almost a week. He thought that may be Sajjan would mend his ways. But all his silent and not-so-silent protests fell on deaf ears. And so, Raunak burst into a passionate tirade. “Lesson? Lesson? ?” Raunak shouted with bloodshot eyes. Lajjo got so scared that she slipped away into the kitchen and started making a glass of lassi. A glass full of chilled lassi was the surest way to cool down Raunak. “Bugger off you idiot! Go teach others lesson when you are driving you own car. Get it in your head! This is my car and you will drive it the way I want you to”, Raunak said this, with an admonishing finger towards Sajjan. “Sorry Saab! It won’t happen again.” Sajjan thought it best to apologize and go away for the time being. Sajjan’s on road adventures soon became the talk of the society. This time the gossip was fuelled by the other drivers. The green goblin was working overtime again. This time it took a fellow driver under its grasp and made it dig out the hidden secrets of Sajjan. Isn’t it ironical that the same jealousy which worked against Raunak and Lajjo the first time was now working for them? The goblin indeed has a strange modus operandi. So the goblin affected driver, convinced that he knew everything to bring the downfall of Sajjan and their supporters, the Sharmas, decided to spill the beans to Lajjo. Unfortunately this ‘pious soul’ didn’t act fast enough. If only he had done that earlier. What? You want to know that happened after that? What did Sajjan do? Ah well…all we can say is you need to have a little patience. Wait till the next Thursday!